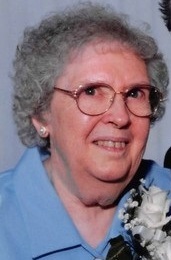 Louise Alta Smothers was born August 6, 1921 in Lenexa, Kansas and passed away on March 20th, 2019 at Lakeview Village, Lenexa, Kansas at the age of 97. Louise is preceded in death by her husband of 73 years, Howard Smothers. Louise is survived by four children: Howard Smothers and wife Barbara of East Palatka, Florida; Ron Smothers and wife Kathy of Wichita Kansas; Linda Hopkins and husband Charles of Olathe Kansas; Kenneth Smothers and wife Theresa of St. Joseph, Missouri; Five grandchildren, nine great grandchildren, and one great-great grandchild along with several nieces, nephews and cousins. Louise was a devoted wife and mother. She guided her family with unconditional love and strength. Her amazing positive outlook on life was an inspiration to her family, friends and community. Louise was the daughter of Elmer and Mable Piercy of Lenexa Kansas. After high school, Louise worked at Jensen Salisbury Laboratories where she met Howard. They were married on August 13th, 1939 in Kansas City, Missouri. After marriage Louise worked for the Fred Harvey Restaurant at Union Station. After her children were grown, she worked for Kelly services and spent many hours in services as a volunteer. She volunteered for the American Cancer Society, American Lung Association and many other Organizations. In 1991 she was selected as citizen of the year in Spring Hill, Kansas. She also was awarded the Grange’s Community Citizen of the year in 1993. She and Howard received the Visions of the Heart Award in 1997. A Celebration of Life Service will be held on April 7th, 2019 at 2:00 p.m. in the Heritage Activity Center at Lakeview Village, 9100 Park Street, Lenexa, Kansas. In lieu of flowers, memorial contributions may be made to the Lakeview Village Foundation or the charity of your choice, in loving memory of Louise Alta Smothers.